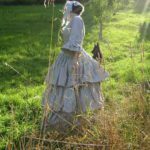 I’ve sewn a Victorian pinner apron as part of my Victorian working woman outfit. 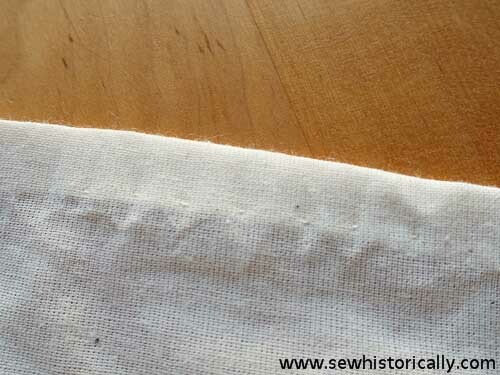 I used unbleached cotton fabric and unbleached cotton sewing thread. 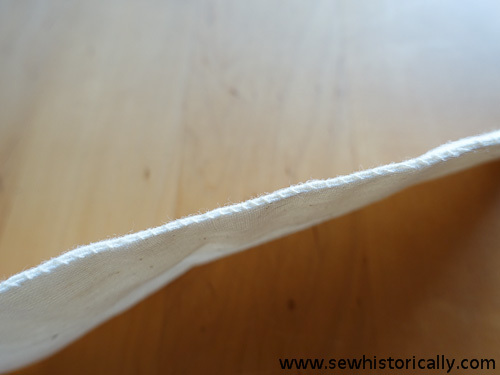 The Victorian apron is completely handsewn in 5 hours. 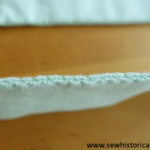 I used overhand and pick stitches for the seams and hems. I attached the skirt part of the apron with cartridge pleats to the waistband and bib. 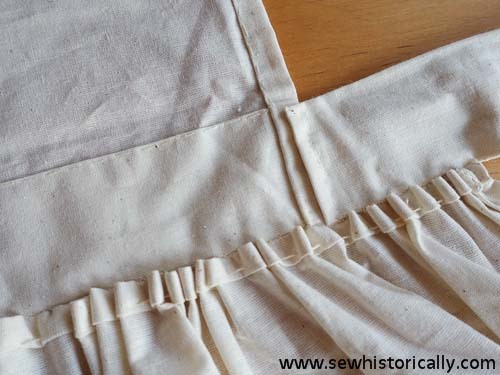 A similar pinner apron is described in the 1840s as ‘a neat pattern for a housekeeper, cook, or kitchen-maid. 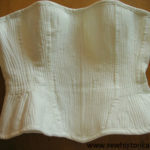 The bib is quite plain, and pins to the gown at the corners. The size given in the Plate is suitable for a girl, but the bib should be cut to suit the wearer at once, and not made by guess. 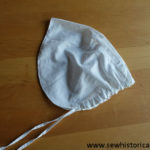 The apron is made of check or strong linen.’ (The Workwoman’s Guide, 1840, p. 79) Here’s a picture of the apron: Plate 11 Fig. 14. Antique Victorian pinner aprons: Photograph of three Civil War nurses, 1860s glazed cotton apron and two servants. … or as an apron without the bib. 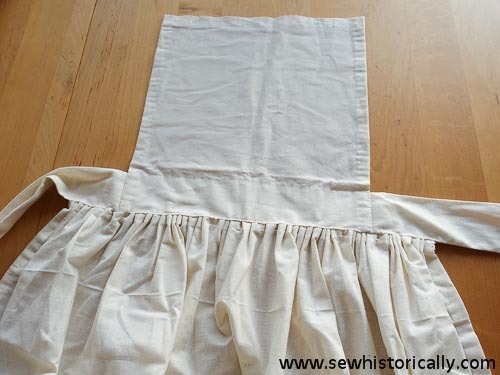 An bib-less apron is described in the 1840s as ‘a simple shape, and the one most in use. It is either plaited or gathered into the band, which is about a nail deep. 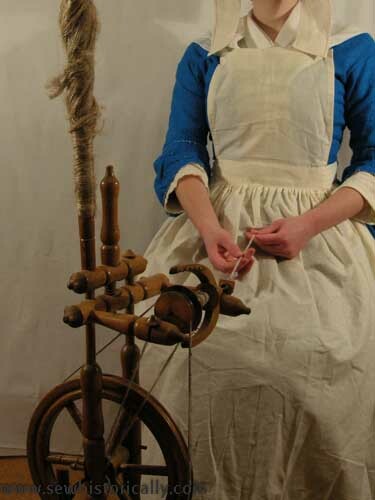 These aprons are usually worn by all servants and women while at work. 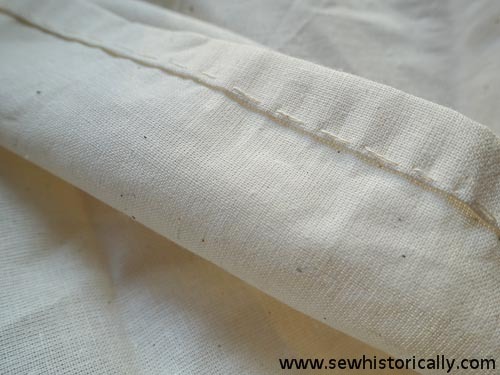 Blue, check, and brown linen are most used for scouring and cleaning; white linen, Holland, and print, for less dirty employments. 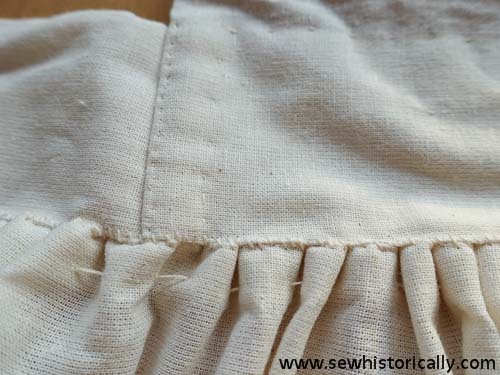 Ladies wear them of silk or muslin, with or without pockets.’ (The Workwoman’s Guide, 1840, p. 78) Here’s a picture of the apron: Plate 11 Fig. 10. And some photographs of Victorian bib-less aprons: Photograph of woman in printed dress, 1860s photograph of cook, 1860s photograph of an elegant Civil War nurse and Hannah Cullwick – maid of all work.